Take our tips for tackling these pesky plants almost anywhere. A weed is a plant that’s growing where you don’t want it to. It's true that dandelion flowers are a sunny harbinger of spring, but if you leave a few to enjoy in your garden, they will quickly reseed everywhere and be a nuisance. Roses or raspberries can even be pests in some situations. After a season or two, and potentially producing several thousand seeds, weeds left unchecked can get out of hand. And some can rob desirable plants of sunlight, moisture and nutrients because they grow so big. The best way to deal with a problem is to prevent it from occurring in the first place. But if you see weeds, don’t throw in the towel. Here are five garden situations where you might encounter weeds and what you can do to take control. Some weed seeds can live in undisturbed soil for many years. If you want to add more garden space, especially a large area, tilling brings them to the surface, where they germinate. Here’s how to get your bed ready and keep weeds from springing up. Prep your new bed in summer or fall so it’s ready to plant the next spring. First, remove the grass and weeds. You can do this with a spade or sod cutter or spray a nonselective herbicide, which will kill everything. A chemical-free option is to cover the area with a tarp or black plastic for 6 weeks to smother and kill what’s growing. Or try soil solarization using clear plastic, which allows the sun’s rays in summer to heat the soil, killing weed seeds and other pests up to 6 inches deep. Whichever method you choose, once your bed is clear, cover the new planting area with a 2- to 3-inch layer of shredded leaves or compost to prevent more weeds from sprouting until you’re ready to plant. After the plants are in place, mulch with wood chips or pine straw to cover any bare soil and help keep the area weed-free. 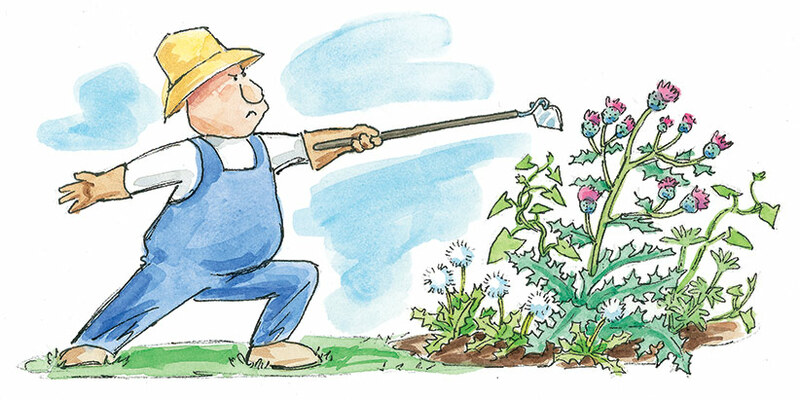 Do you avoid growing a vegetable garden because it gets overrun by weeds? And, of course you don’t like to use chemicals around your edibles. Here are some things you can do to be more successful. Hoe weeds as soon as you see them. But above all else, be sure that they don’t flower and go to seed. Here are a couple essential tools to try: A stirrup hoe has a thin oscillating blade that cuts through weeds just below the soil surface as you push and pull. A narrow collinear hoe is designed to work in tight spots so you don’t wipe out tiny seedlings and tender greens with one chop. Mulch around plants and cover paths with a 2-in. layer of untreated grass clippings or clean straw to suppress weeds and hold in moisture. Just keep it a few inches away from the base of the plants. Also, these mulches can be left in place to break down into organic matter. Weed seeds can find their way into the smallest places—even the crack of a sidewalk or driveway—and become unsightly. Boiling water can be effective. Carefully pour it over the plants, cooking them. For persistent weeds, you may have to repeat this. Hand pulling can be tedious and painful if you scrape your knuckles trying to get all of the roots. Use needle-nose pliers to grab hold of even the smallest weeds. Propane flamers are another nonchemical option. They work by heating the plant to the point that their cells burst. Take precaution when using flamers around mulches and don’t use them in dry, fire-prone areas or on windy days. Ground covers are great for creating a mat of foliage over an area in your garden. They’re especially useful on gentle slopes or other challenging locations and help keep the garden weed free as a living mulch. But sometimes you don’t notice weeds growing in them until they grow big. When tree seeds sprout, they’re especially tough to pull as they grow larger and woody. Pull tree seedlings and other weeds along with their roots as soon as you see them. It’s easier to do this after it rains; or water the area well in the evening and by morning, you can pull the weeds. Trees can resprout even when they’re cut back, so dab systemic brush killer herbicide on the wound, which kills the roots. But be careful in this situation because it can also kill the ground cover if their roots are entangled. 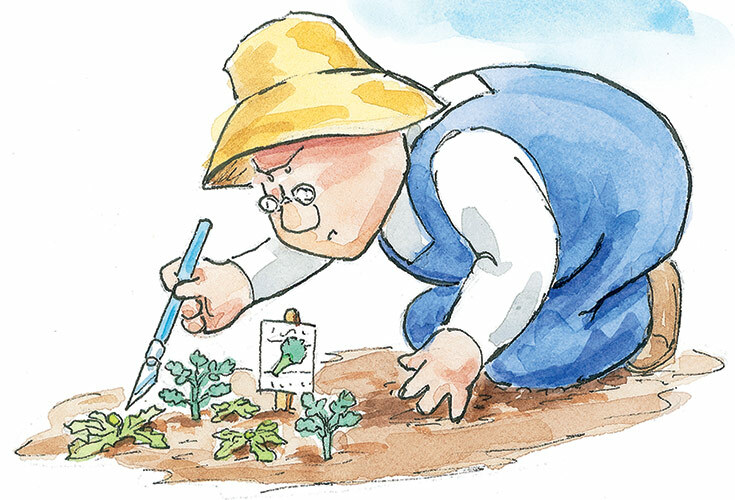 There may be a year or two where your garden got away from you and it’s difficult to determine where your flowers are because of all the weeds that have filled in. A situation like this can be overwhelming, but with a little effort and patience, you can get your flower bed back in order. If you work at it slowly, a small section at a time each day, then it won’t be long before the job is complete. First, hand-pull all the weeds, getting as much of the root as you can. You’ll need to use a spade to dig out long tap roots. For large patches of tough weeds, like quack grass or ground ivy, you may want to use an herbicide to knock it out. Here’s how you can do this without harming nearby perennials: Use a plastic bucket or large nursery pot with the bottom removed and slip it over the weed, so you can target the spray to what’s inside. Once your bed is cleared of weeds, apply a pre-emergent herbicide, such as Preen® Weed Preventer or Concern® Weed Prevention Plus®, to stop weed seeds from germinating. Take note—it will prevent any reseeding perennials from coming up, too. Next, add a 3- to 4-in.-thick layer of mulch around your perennials, leaving a space about 2 in. from the base of each plant to reduce the possibility of crown rot.